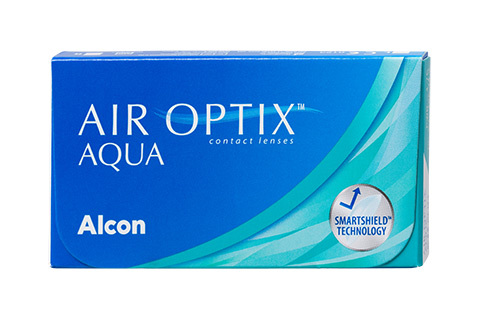 Enjoy crystal clear vision and exceptional comfort with AIR OPTIX Aqua 3 Pack Monthly disposable contact lenses. A high-quality offeringfrom Alcon, one of the most trusted names in the eyecare industry, these contact lenses are a fine combination of advanced technologies, superior lens material, and excellent craftsmanship. AIR OPTIX Aqua 3 Pack Monthly disposable contact lenses is a superb choice for those who lead a busy lifestyle. Reason? The ultra-smooth surface technology is effective in preventing debris deposits at the surface. So your eyes will never feel dry or uncomfortable throughout the lens wearing duration, even after a month. The advanced lens material provides up to five times more oxygen through the lens than conventional soft lenses, setting AIR OPTIX Aqua 3 Pack Monthlydisposable contact lenses a class apart from the rest. You can wear these premium silicone hydrogel contact lenses continually for 6 nights and 7 days. However, it is always recommended thatyou speak to your optician about your lens wearingpattern to get the full benefits. Or simply get intouch with our qualified online opticians at Mister Spex, and they will help you find the righteyewear in no time.